Occasionally I have problems establishing a credible birth year for an artist. This is because dates change over time as artists like to appear no older than they need to! When I'm not sure, I usually present the date that makes the artist look the youngest. However, I have no doubt that the birth year I've shown for Julie Rogers is correct because she attended the same Primary School (Oliver Goldsmith) as my wife! In fact, despite having been born in London's East End, Julie grew up and gained her education in the pleasant suburb of north west London called Kingsbury. Julie began singing in her childhood, learning the piano at an early age. She had a passion as well as a talent for singing, and on completing her education- like many other artists before and since- she began entering talent competitions. It was through this that she met the former trumpeter and musical director Teddy Foster. Teddy became her long term manager, mentor and companion. She and Teddy formed a double act, but her big breaks came after she turned solo. 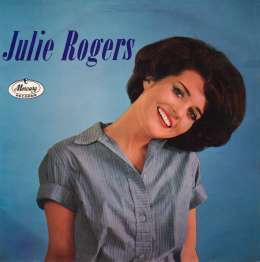 The EP shown on the left (Mercury 10023 MCE, "Julie Rogers") was Julie's first on that format. It effectively contained both sides of her first two singles releases which were recorded in the company of the Johnny Arthey Orchestra and Chorus. At the time of the release of 'The Wedding' she had told the New Musical Express that she wanted to become an international artiste. By the time this EP had been issued, just a few weeks later, that ambition had already been realised. Although she had other hits, it was 'The Wedding' that changed her career and guaranteed her an audience for life. This sentimental song sold massively, rapidly passing a million copies for the record company, Mercury . Although it did not quite reach the top in the UK, it proved popular world wide gaining high chart positions in very many countries including an important #10 in the USA. Julie followed this up with two more hits, but never managed to produce anything as distinctive or original as her first great hit. 'The Wedding' was sufficiently well known that Julie has been able to tour all over the world on many occasions. She has become a familiar performer on the cabaret scene and must know every night club in the UK. While still in her teens she worked briefly on a cruise ship- something she has done many time since, but in the role of starring performer- no longer as a stewardess. Ember EMBS273 1969 Which Way To Nowhere/ Love Them From "Michael And Helga"